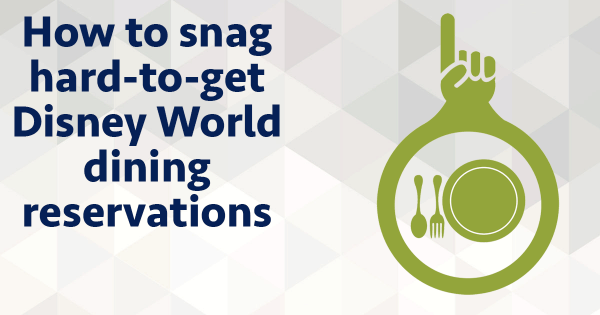 For lots of Disney World guests, planning where they'll eat each day is part of the fun. Whether you are adventurous or like to stick to the classics, Disney World food options are nearly endless. But, like with all things related to Disney World, there is a lot to know. To help you figure out what is going to be best for your trip we have a bunch of Disney World dining information, terms, and tips to help you out. What is the best snack value? Do I need them to dine at Disney World? Do all Advanced Dining Reservations have to be made 180 days out? Have you heard these terms and wondered what they were? Simply speaking, Table Service restaurants are ones where a waiter serves you. 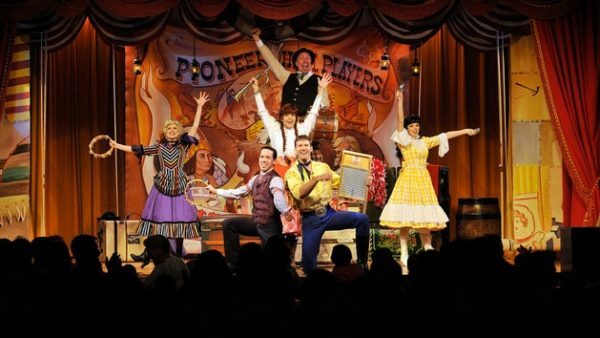 Also included in the Table Service category are buffets, all character meals, dinner shows like Hoop Dee Doo, and meals served family-style. As you can imagine, restaurants identified as Table Service will cost more than many dining options. Signature Dining experiences are the most expensive of all the Table Service experiences at the Walt Disney World Resort. These meals are known for having the best (and most costly) food options. If you are on the Disney Dining Plan, restaurants that are on the plan will cost you 2 Table Service credits instead of the usual 1. Since they are a bit more upscale than other Table Service restaurants, many Signature Dining restaurants are popular options for people looking for someplace to celebrate an anniversary, birthday, etc. during their trip. Disney has 2 very popular dinner shows that guests can book up to 180 days in advance. 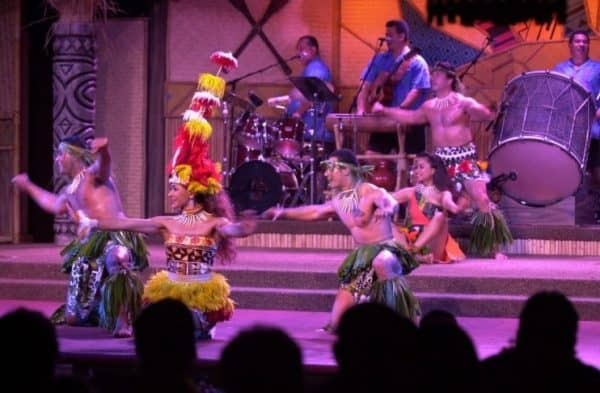 Disney Dining Plan credits can be used to pay for these dinner shows. 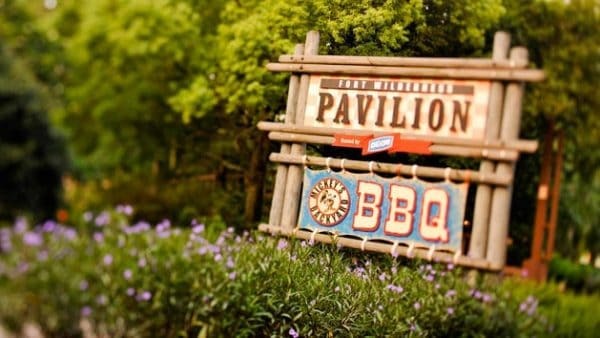 There was a 3rd popular dinner show called "Mickey's Backyard BBQ" but due to construction of a new resort along the lake it has been closed since the end of 2018. Disney has mentioned that it hopes to bring it back in some form but as of now nothing has been announced. Quick Service (also called Counter Service) restaurants are ones where you order at a counter, just like you'd find at any fast food restaurant. The only exception to this is Be Our Guest breakfast and lunch. This is considered a Quick Service option for those meals, but it works a little bit differently than any other Quick Service location. 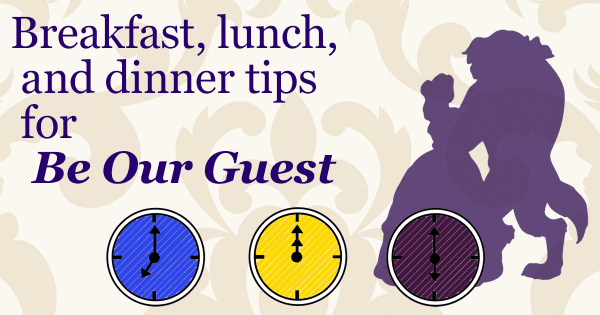 Be Our Guest allows you to pre-order breakfast and lunch up to 30 days in advance. At the restaurant you seat yourself but instead of waiting at the counter for your food, it is brought to your table. Get more information on dining at Be Our Guest Restaurant. In addition to regular restaurants, you'll also find kiosks and carts that often have limited selections but amazing food options like Dole Whips, Mickey Pretzels, and poutine. And, if you are heading to Epcot during one of its many, many festivals you'll find even more options for dining at one of the special festival food booths there. 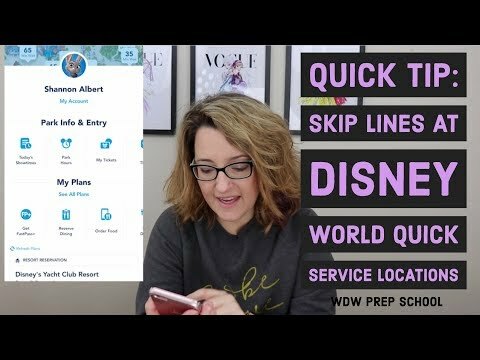 Lots of Quick Service restaurants at Disney World allow you to order your food ahead on the same day you plan to visit. Mobile Order is found within the My Disney Experience App. From there you're able to order your meal (including having the ability to customize it) and pre-pay using either Disney Dining Plan credits or the credit/debit card you have linked to your My Disney Experience account. After ordering, all you have to do is tap the "I'm here" button when you arrive. That lets the cooks know you're ready for your food, and before you know it you'll be notified that your order is ready to pick up. Mobile Order saves time and hassle of standing in line. If you have children or a large group, Mobile Order can make ordering a lot less stressful, too. One of the most frequent questions we hear is "How much should I plan to spend on food at Disney World?" The truth is from trip to trip and person to person, the food costs will vary widely. Opportunities to save on food at Disney World are just about as plentiful as the opportunities to splurge. There are 2 main ways to plan for your food costs: averaging (which is easier) and restaurant by restaurant. If you want an "average" amount to plan for, your best bet is use the average cost of the Dining Plan credits. While not perfect, it will give you a rough estimate as to what the average prices at most Table Service and Quick Service restaurants will be. For 2019 that means you should plan to spend about $18/adult at each Quick Service meal and around $41/adult for Table Service meals. Signature Restaurants will cost about double that. Kids age 3-9 will be roughly 40-50% of the adult costs. Want to be more exact? If you want to know exactly how much you'll be spending, the only way to do that is to look over the menus for each restaurant and make a guess as to what you'd order. Do that for every restaurant and you'll have a good idea as to what all your main food costs will be. The 2 best sources for current menus are the Disney World website and AllEars.net. AllEars in particular is good about having the prices for buffets and places where you dine family style, which is something you may not find on the Disney World website. If you plan on dining at any of the Table Service restaurants, make sure you budget 15-20% of your bill for tips. Get more info about tipping in this tipping video. Dole Whips. Mickey Bars. Popcorn. Pretzels. School Bread. Churros. Turkey legs. There is nothing quite like the array and selection of Disney World snack options in the parks. Whatever your craving - be it sweet or salty or with a little added alcohol, you'll have a million (rough estimate) options to choose from. Everybody wants to know the best value when it comes to snacks and as much as we'd love to compute that for you, it would be a nightmare to maintain. Menus change constantly. Prices change constantly. And with so many snack options around the park, it would be a full-time job just to maintain that list! In general, if you are on the Disney Dining Plan and you want to get your money's worth, snacks at least $5 are a good value. If you'd like to see current confirmed snacks, this spreadsheet of confirmed snacks (which wasn't created or maintained by us) does a good job keeping up with some of the most popular options. If you are the kind of person that feels better knowing their Disney World food costs before they go, then one of the Disney Dining Plans might be for you. Is it the most cost effective? Sometimes. But for some people, knowing the cost up front allows them to relax on vacation and takes the stress out of their trip. 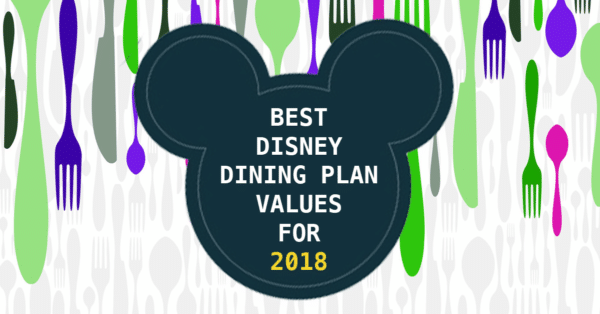 If this sounds like something you might be interested in, we have a huge post all about the Disney Dining Plan (including the best use of your credits) that can help you decide if it is right for you. Call ahead seating is something that has become popular across the United States and Disney has their own version called Advanced Dining Reservations. Starting at 180 days out, guests can book their Advanced Dining Reservations (often called ADRs) either online or by phone. Staying onsite? Good news! At 180 days out you'll be able to book that day plus up to 10 additional days. The ability to book the 10 additional days is one of the perks of staying onsite). Guests staying offsite that want to book at 180 days will need to log in or call each day at exactly 180 days out to snag their reservations. Your Advanced Dining Reservation works the same way as call ahead seating. This means it's not like a traditional reservation where you walk in and are seated almost immediately. In a lot of instances, you'll still have to wait. And at some places, you'll wait longer than others (we're looking at you, 'Ohana). Instead, your Advanced Dining Reservation (ADR) puts you on the list and guarantees you a seat. Depending on how fast or slow the tables are turning over that day will determine how long your wait is. Disney does a good job, however, of timing things out so usually the wait is around 15-20 minutes. The short answer is yes. If you want to dine at a Table Service restaurant at Disney World, you'll need to have Advanced Dining reservations. Now, with that being said, you'll always hear anecdotal stories from people that were able to "walk right up to Be Our Guest and get the best seat in the house." These stories are not always based in fact AND they are not common. At all. If you have your heart set on dining at a particular restaurant and want to have control over what time you eat and not be left with only a few options, please make those Advanced Dining Reservations and make them as soon as your plans are finalized. Not all reservations will need to be made at exactly 180 days out, but if there are things that you must do or if you are trying for some of the more popular reservations like any of the character meals or the Chef's Table at Victoria and Albert's OR if you have a large group, you'll want to be ready to make those as soon as your booking window opens. Want to learn more? Read up about how to snag hard-to-get dining reservations for more information. The OpenTable site/app has many non-park Disney World restaurants available to book. That includes restaurants located in the resorts and Disney Springs. 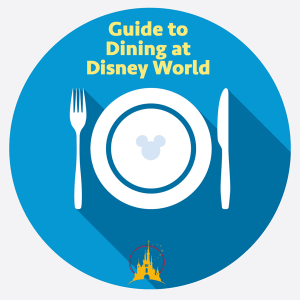 The reason this is especially handy is that many of these restaurants only release a portion of their availability to the regular Disney World dining system, so if you can't find a reservation through Disney, try OpenTable instead. "Amazing." "Best experience ever." "I had no idea it would be this easy." 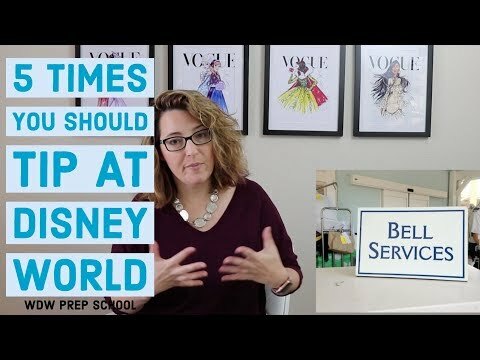 All things that people with allergies or other special dietary concerns say when they get to Disney World and experience the customer service provided to them. From the top down, Disney goes above and beyond to make sure guests traveling with any dietary concerns are safe and well taken care of. If you'll be traveling to Disney World and are interested in learning more, the best place to start is at the official Disney World Special Dietary Requests webpage. Want more information? Don't be afraid to check out groups like the Disney Food Allergy Group on Facebook. There you'll find families sharing their personal experiences which can be invaluable when trying to plan. Whatever your budget there isn't anything wrong with trying to save a few dollars. On the Disney Dining Plan? If you want to get the most for your money, you'll want to maximize those credits. But don't worry - we've done the math for you to make that easy. Annual Passholders have the option to purchase the Tables in Wonderland card which gives a 20% discount on food and alcohol as well as giving you free valet parking. This card works at more than 100 restaurants at Disney World. You'll want to balance the extra cost of the card with the money you think you'd save to see if it makes sense for you. Mousesavers keeps a great list of dining coupons that you should check out to see if any of the places you plan to eat have offers available. This is one of our favorite ways to not only save a few bucks but to also speed up your mornings (so you can get to the fun faster!). If you want to save some money, you should think about eating breakfast in your room. 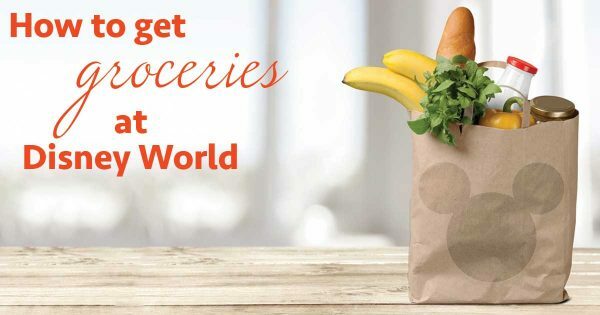 Getting groceries for your hotel room has never been easier, and that means you can have your favorites on-hand and ready to go when you wake up. Fruit, yogurt, granola bars, cereal, protein shakes - whatever your go-to quick breakfast is at home you can have it in your room, meaning not only will you save money you'll also save time. This is a super simple way to easily save $10/day for a family of 4. Just bring your own water! One of the downsides is that it can be heavy to carry several bottles of water, so this works better if your kids are old enough to carry their own OR if you'll be using a stroller. By simply bringing in a bottle of water for every person in your group, you can save a lot of money that you can then use on other important things like Mickey bars! Some of the portion sizes for meals at Disney World are quite generous and that means they can be easily split. If you have light eaters in your family or if you're just not hungry enough to finish something on your own, than sharing a meal is an easy way to save some money. 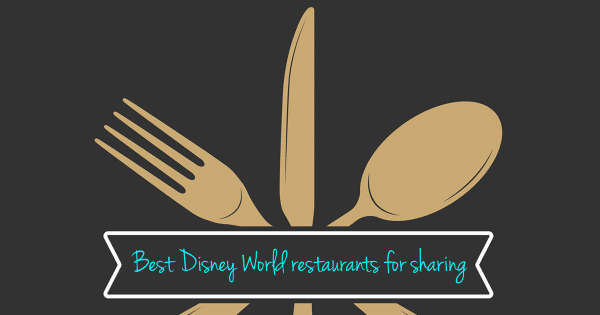 Check out our post on the the best restaurants at Disney World to share meals for more details. If there are some Table Service meals you'd like to try, you can usually save some money by eating them for lunch or breakfast. This is true even for character meals. Have a car? Not afraid of going outside the "Disney bubble"? You'll find all sorts of restaurants nearby that will cost a lot less than eating inside the park. One note of warning: A common scam for resort guests are pizza flyers that get shoved under your door. Often times these pizza places are just people trolling for your debit and credit card info - you place an order over the phone, give them your payment info, but no pizza ever shows up. Avoid those scams by only using outside vendors recommended by Disney. Some people really love doing all the planning on their own and for them the planning is half the fun. But for others, the the thought of planning out where they are going to eat 180 days in advance and scheduling Advanced Dining Reservations makes them feel overwhelmed. If the latter is you, do not despair. We have the experts you need to take the stress out of planning. You can find out more about using a Disney Travel Agent or if you're ready to connect with somebody on the team, you can get a no obligation quote now.